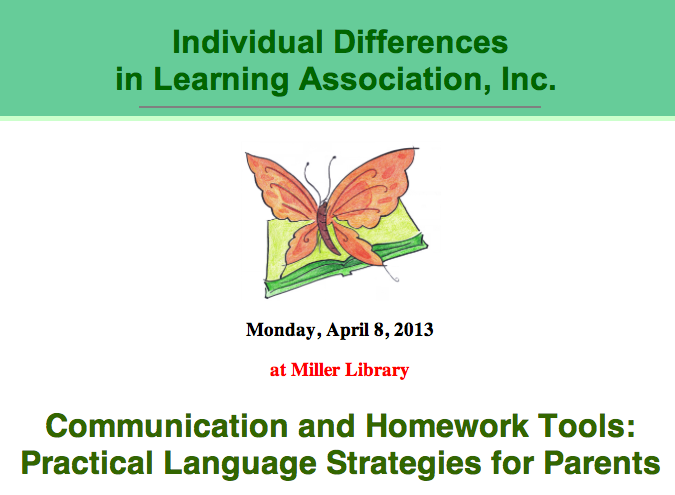 If you are in the Baltimore area, you might want to check out Monday night’s meeting of the Individual Differences in Learning Association, Inc. (gifteddifferentlearners.org) 7 pm at the Miller Library in Ellicott City. They provide support, training and information for teachers, students, parents and others concerned with the well-being of learners. It’s a very informative, supportive atmosphere and they provide a great service for all. I’ll be talking about low tech and high tech strategies to make the learning process easier when helping their kids with homework and maybe present a few new ideas that educators would enjoy learning about. If you can’t make the meeting, tomorrow night I’ll post a copy of the presentation on this blog and a copy of the handout.